I don’t even know where that line comes from, but it’s become emblematic of my ongoing quest to complete the interior caulking of the cabin. K just started exclaiming, “Yeah, I’m Jimmy” every once in a while, and it has stuck. Kind of like AC/DC was the official music of the Summer of Roofing because, without fail, an AC/DC song would come on the radio the second we got up on the roof to work, out of reach of the radio (I do not like AC/DC). So, we’ve not been goofing off. We have been going full steam ahead, every day we can eke out, away from clearing up work issues for summer, etc. Today I finished caulking all of the major seams in all but the bedroom and closet. Quantitatively, this is like being about 3/4 done with interior caulking. OK, maybe 1/3 done since I have to join the bases of logs to the floor. The floor (Part 2: Doing it Right) will be getting started later this week, then after it’s dry, I can seal in the log bases. But still, awesome progress on caulk, if I do say so myself. How to hide electrical: before, a small log left a channel on the interior. During: a leftover slab cut to fit around the box. After: other half of slab added above, and all caulked in. Looks like a whole log! Meanwhile, K has been working on building a small room in the cellar that will house our water system, and doing a bunch of other site work. And we’ve both been working on prepping the big house to put on the market…soon! While someone had to sit at a long graduation ceremony today, the dog and I went to the cabin to see if I remember how to caulk the logs. Nailed it! We got a good section done, and more importantly, just got going again on this rather tedious job. More later this week – now we can roll with it. 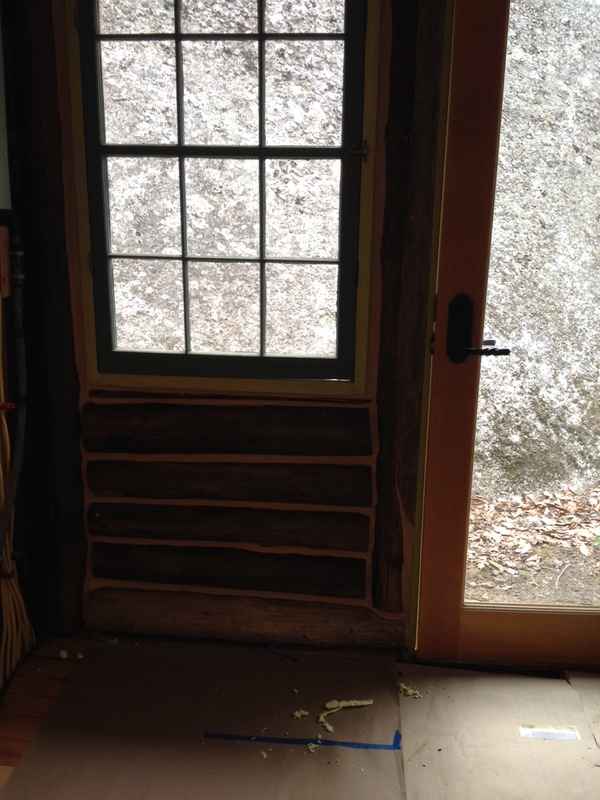 Big step today – we installed the French doors! We have a few final things to do on them (clean glass, install rest of hardware), but they are in and they fit! Not bad, considering it’s my first French door rebuild. We are loving the gray stain – it was the only thing that made sense in the end, despite my always wanting to keep the original wood. They look oh-so-French. One of the pair of doors, as purchased. Closer up: some really nice moulding on this set. But not-so-nice history of cutouts. Paint was many-layered and included Mac & Cheese orange. All over the door. Seriously. Stripped, but still had those pesky holes. Al the hardware was gooped up as well. The hinges were gorgeous (and incredibly well-made with beveled edges and lots of detail). And – ta da! Yes, I still need to clean the glass. And from the dining room area – it looks almost done! This is the temporary/repositionable wallpaper that’s our short-term kitchen backsplash.